Sprites are small pictures that can be moved around the screen and animated. By using sprites, you can make games that have a more realistic look. Sprites are two dimensional (flat) but if you are good at drawing, you can make them look like they have depth. 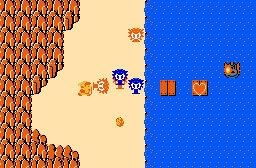 Link and the Octorox are clearly flat two-dimensional sprites. But, there's no reason to stick with a 2D look when you can fake a 3D look. Age of Empires is a good example of 3D-looking sprites. QBASIC has two statements that support sprites: GET and PUT. We will be working with GET and PUT quite a bit in this section, but in the end we will have to find a new way to draw sprites. There are some pretty serious problems with GET and PUT as you will see. If you need to brush up on your QBASIC skills, see my QBASIC Tutorial before you continue. How did I know it had to be 37? Well, there is a formula you can use to figure this out, but since this program is so small and there's only one sprite, I used trial-and-error. I kept picking numbers and trying to run the program until I found the right number. QBASIC will give you an error if the array is too small. See the QBASIC Help topic "Screen Image Arrays and Compatibility" for the formula. The coordinates (0, 0)-(8, 7) define a rectangle on the screen. This is done the same way you tell the LINE statement where you want to draw a box on the screen. GET will copy the picture from that rectangle into the Ball% array. Running this example, you will see a filled circle in the upper left corner of the screen. This is the first circle we drew to make the sprite. Then you will see another filled circle near the center of the screen. This is a copy of the sprite made by the PUT statement. I have to admit that I am writing this chapter of the book first. So, I'm assuming that I've already discussed the basics of motion in an as yet unwritten chapter on real-time text games. I will fairly quickly go over motion here, but not discuss it in too much depth.
' we redraw it in its new location.
' Timing Loop. Pure Evil. Depends on computer speed.
' Change the 30000 to change the speed of the ball.
' it in its new position at the top of the loop. You might need to adjust the 30000 in the timing loop to get this to go at a reasonable speed on your computer. The strangest thing about this example is how it uses PUT both to draw the sprite and to remove it. PUT can do this because it draws our sprite on the screen using something called an "exclusive or" or "XOR" for short. We will talk more about this later. Using CIRCLE and PAINT is fast, and handy, but let's face it. It's hard to draw anything really interesting this way. For that, we need what's called a bitmap. A bitmap is a picture stored in a way a computer can understand. Since computers are most fond of numbers, it's no surprise that a bitmap is made up of numbers. It's like coloring by number. Where there is a 0, there will be a black dot (pixel) on the screen. Where there is a 15, there will be a white pixel on the screen. This particular bitmap is organized to be 3 pixels wide by 3 pixels high. It is very small as we will see when we draw it. This reads the bitmap from the DATA statements and draws it on the screen using PSET. You will see a very tiny diamond in the upper left corner of the screen. That's our bitmap. Try changing the bitmap to this and see what it looks like. And finally, let's try a more colorful bitmap. Our bitmaps don't have to be tiny, we can make them as big as we want. Here's a bitmap that is 15 pixels wide by 15 pixels high. Hopefully you can cut and paste this one into QBASIC. Otherwise, it's a lot of typing. Can you guess what it is a picture of? You can use graph paper and colored pencils to design your bitmaps, then copy them block by block into DATA statements. Making large bitmaps like this can take a lot of time. Fortunately, there are bitmap editors that can make the job much easier. Unfortunately, those bitmap editors can't write DATA statements for you. However, if you wanted to, you could write your own bitmap editor in QBASIC and have it write the DATA statements you need. Might be a good project. Combine the bitmap above with GET and PUT, and you've got yourself a new sprite. Since DATA statements and files are pretty much the same thing, you could store your bitmaps in files, and read them in from those files. The nice thing about DATA statements is that they are always right where you can find them. The bad thing is that DATA statements make your program bigger. I also think DATA statements look a bit messy. The nice thing about files is that they do not make your program bigger (or messier). The bad thing about files is that you need to find them on the hard disk. Very large game programs usually store their sprites in files to reduce the size of the program.
' NEW: Make half the screen yellow. Notice how as the ball enters the yellow area, it changes colors. Although this is an interesting effect, it might not be what we want. Many times we will want the background and foreground to stay the same. The problem is XOR. As I mentioned before, we are using an exclusive OR, or "XOR" for short. While XOR is really great for drawing and erasing using the same bitmap, XOR causes problems when it encounters a background other than black. We need something new. One possible solution is to use a mask along with the bitmap. We PUT the mask with AND, then PUT the bitmap with OR. This works fine. However, there are so many problems with PUT that we are going to have to stop using it. Before we do, we will discuss why in the next section. SCREEN 13 goes all the way out to 320 on the X coordinate, yet QBASIC gives us an Illegal Function Call when we try to draw our sprite at X coordinate 312. Why? Because the sprite would go off the right edge of the screen. For our bouncing ball, this isn't a problem because we don't want it to go off the edge of the screen. In a real game, this is a serious problem. Consider a game where the screen scrolls (shifts) from left to right. It would be nice if the sides smoothly came in on the left, and went out on the right. But, if you can't draw your sprites at the edges of the screen, the left and right edge would suddenly disappear (or you'd get an illegal function call). It would be better if PUT would "clip" the sprite by cutting it off where the screen ends. Unfortunately, PUT cannot do this. This means we need to make our own PUT that can do clipping. The second problem with PUT is the fact that it cannot support a technique called "double-buffering" or "page-flipping". We will discuss this technique later. Why is PUT so bad? When PUT was originally created, computers were incredibly slow. No one ever imagined being able to write a serious game using BASIC. So, Microsoft didn't take PUT too seriously. Now that computers are incredibly fast, we can write our own PUT, or use someone else's to solve the problems with QBASIC's PUT. Now that I've convinced you that we need a new PUT, it's time to make one. Our first goal is to get something that acts like QBASIC's PUT. It has to be able to draw a bitmap on the screen. Although we could write a new GET, there really isn't a need. Most sprites will be bitmaps, so we can use DATA statements or files instead of GET to fill in our bitmap array. Here's the first example of working with sprites and avoiding PUT. Instead of GET, we copy the bitmap from the DATA statements into an array. Then we use PSET to draw what's in the array to the screen. Note that this is a two-dimensional array. Two-dimensional arrays are perfect for this kind of problem. After all, a bitmap is two-dimensional. It is unfortunate that there is no way to break long lines in QBASIC. That first line is pretty long and ugly. The first argument "Ball%()" is the array that holds our sprite. PUT2 will copy from that array to the screen. The next two arguments (9, 7) are the size of the sprite in pixels (9 across, 7 down). The last two arguments (0, 0) are the X and Y position where the sprite should be drawn. Here is the complete program using the new SUB. Not bad at all. It wouldn't be too big of a jump to add some motion to our ball, and see how well this works. We'll eventually get to clipping, but first we will solve the infamous "flicker" problem. This will have an effect on how we do clipping, so we'll get it out of the way first. In a simple ball-bouncing program, it is hard to see the need for page-flipping, but imagine a much larger game. One with hundreds of sprites on the screen at one time. Each time the sprites move, we need to erase them from the screen and redraw them. Not only that, when we erase them, we have to restore the background that was under them so they don't destroy it. What a mess. What a lot of work. This could take quite a bit of time. And all that time, the user will see what we are doing. The user will see us erasing and redrawing. It isn't pretty. Page-flipping to the rescue! Page-flipping lets us hide what we are doing, and it will also let us simply start from scratch and redraw the entire screen instead of worrying about redrawing pieces of the background all the time. If we have hundreds of sprites, this will be a real time-saver. Page-flipping (also called double-buffering) solves these problems by letting us draw to an invisible screen (a memory buffer, or double-buffer), then copy that invisible screen to the visible screen. This way our drawing process can't be seen.
' NEW: Screen 9 with 0 as the "active page" and 1 as the "visible page"
This is much better. We see the image each time, not the drawing of the image. This is what page-flipping is all about. SCREEN 9 provides two pages for us to work with, page 0 and page 1. The SCREEN command lets us decide how we will work with those pages. In the previous program, the SCREEN line has mode "9" specified. The next "0" is ignored. After that is a "0" for the "active page". This is the page where the LINE command will draw. The next value, a "1" specifies that page 1 will be the "visible page". This is the page that is displayed on the screen. All together, this says that we will be drawing on mode 9's page 0 and looking at mode 9's page 1. This seems like we would never see anything at all. That would be true if it weren't for PCOPY. In fact, try commenting out PCOPY and see what happens. In a word, "nothing." The PCOPY command copies everything from page 0 to page 1 almost instantly. So we can take our time drawing on page 0, then when we are done, use PCOPY to copy what we drew to page 1 so the user can see it. As an aside, I cheated to make the program even slower. I didn't do a DEFINT A-Z. This means all the variables are treated as single-precision floating point. Try throwing in a DEFINT A-Z and you'll notice a slight performance boost. Unfortunately, page-flipping with PCOPY is only available in a few SCREEN modes. It isn't available in the more colorful modes like SCREEN 13. If we want to do page-flipping in SCREEN 13, we'll have to write our own version of PCOPY. To make our own PCOPY, we'll need a way to draw to a memory buffer, then copy that memory buffer to the screen. This is called "double-buffering". The fastest way to copy something to the screen is to use QBASIC's PUT. It is written in Assembler, and is very fast. Its drawbacks when working with sprites (clipping, etc...) are not an issue when we are copying from a memory buffer to the entire screen. The only thing we need to figure out is how to draw into a memory buffer that PUT can understand. Since we will use PUT to flip our memory buffer to the screen, we must understand the format of a memory buffer used by PUT. Then we can write some SUBs that allow us to draw in a PUT-compatible memory buffer. Our most important SUB will be our PUT2() that we wrote for drawing sprites. Where there is a special value in the data, don't draw anything. Pick a number that isn't a valid color so that we still have access to all the colors. Check the bounds. If out of bounds, don't draw. Update PUT2() to be bounds-aware. The above examples have been designed primarily for education, not for speed. Many improvements can be made to improve performance. Here are some suggestions. Assembler. Rewrite critical parts of the code in assembler. Our PUT2() routine is a good candidate. Space. Make your sprites more space-efficient by storing them using bytes instead of 16-bit words. This is the outline I used to work on this section of the book. It is much more complicated than the book ended up. It discusses all the different directions you can go with sprites. In the end I decided to take the shortest possible path from PUT to page-flipping. - Sprites aren't always the best solution. But they usually are. the fastest and easiest. It will make the code much smaller. the code much larger. Lots of PSET()s.  Very hard to change. V Generate: Draw with whatever QBASIC statements you need. V Load: Just do a GET, and you are done. V Sample: Basic sprite program with a moving sprite. Mention unusual use of an array as simply a chunk of memory. V What is the alternative? V Storing bitmap data in DATA statements or files. - Which is best, DATA statements or files? V See QBASIC book for info on DATA statements. OPEN/INPUT/WRITE/CLOSE, we use RESTORE and READ. - DATA statements make your program larger, but are easier to find. * Deciding on a "format"
or a standard format like .BMP. - Draw what you want, then use POINT() to build the dataset. - May already be sprite editors available. Pixel Art 1.0 is an example. - Easy to load, but slow. - Render to the screen, then use GET. - Sample: DATA statements and human-readable data. Moving sprite. - Draw what you want, do a GET, then dump the array. if you can only find a sprite editor that exports that. - May already be sprite editors available, if not, write one. MiniRPG.bas from REL. Or just read it in the old-fashioned way. - Ties you to PUT? Harder to clip. Harder to do transparency. PUT format, or in a more wasteful 16-bits per pixel format. - Sample: Generating the PUT file. Reading in the PUT file. Moving sprite. human-readable one integer per pixel, and a binary file format. - Easier to manipulate with your own PUT routine. - Data can be layed out so that it is easy to clip. - Data can have special values that indicate transparency. third-party tends to be overkill. - Slower to load since there might be lots of unnecessary header info. - Sample: None. You're on your own here. V PUT, already discussed above. V If there is a background, the sprite changes colors. sprites can only be rectangular. V Background buffering. Do a GET before you PUT, then PUT it back. V Making your sprite something other than a square or rectangle. is made by a 255 in the mask and a 0 in the image. V The limitations of PUT() far outweigh the advantages. assembler, so it is extremely fast, even on a very slow computer. In this day and age of 3GHz+ machines, speed isn't an issue any more. V PUT() will not clip. The program crashes instead. Not good. do this in one shot with our own version of PUT(). without a mask and save space and work. has something like this already. is not visible. This can cause flicker. - Background buffering would be faster than redrawing the whole screen. But maybe we need to redraw the whole screen anyway. games typically use a scroll routine, or some hardware feature? - Check MiniRPG.bas for clues here. - Sample: Full-on final version showing all the "best" techniques. - More than one image in a file. - Generating a file with more than one image. - How to access each image with PUT(). - Sample: Simple animated sprite. Search for qbasic sprite in google to get a good idea of the tricks involved.